Bishops of the Evangelical Lutheran Church in Tanzania (ELCT) on 18 October visited grief-stricken ELCT members at Mbagala Parish, in Dar es Salaam to offer solidarity and hope following a spate of church burning by a faction of Moslems. Bishop Dr Alex Malasusa ELCT Presiding Bishop. 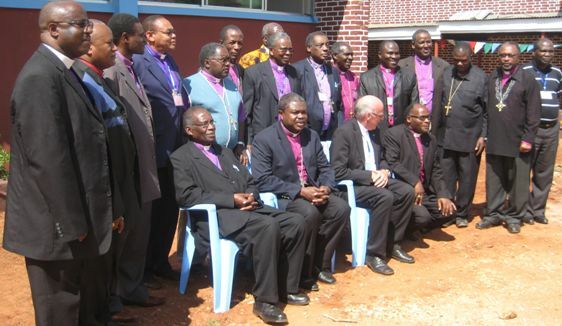 Some of the ELCT Bishops. IN MBAGALA AREA - DAR ES SALAAM. Grace be to you and peace from God our Father and the Lord Jesus Christ, Amen. 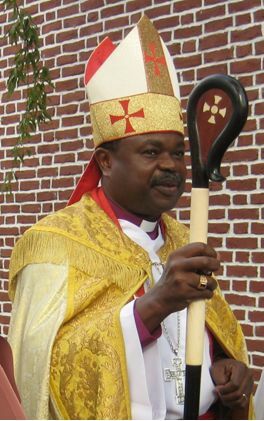 We bishops of the Evangelical Lutheran Church in Tanzania (ELCT) have received with a great shock the news on the incidents of burning of Christian churches in Mbagala area. Gathered at our annual Round Table of the Lutheran Mission Cooperation (LMC) in Moshi which brings together ELCT and all partners, mission organizations and churches from Europe and America, we have cut short the meeting so that we may be able to come here at Mbagala. 1. We have come to sympathize and stand in solidarity with you in the great pain you are going through. Your tears are our tears. Our tears are tears of Christ Himself, the Lord of this persecuted Church. Take heart, for he had overcome the world (John 16:33). 2. We have come to show our profound grief for the acts of breach of the peace, unity and solidarity of Tanzanians. This is a great tragedy, and this tragedy is for all Tanzanians- those believers in religion and those without religion. 3. We have come to share with you the hope of receiving a new Tanzania. In these ashes resulting from the burning of the altars of Mbagala churches, a new Tanzania will be born. These ashes and your tears are nourishment to a new Tanzania that cares, and has love, patience, perseverance, unity, solidarity, freedom of worship and a secular state. 1. We have not come to judge even though we disagree with those who look down upon other people's religion, whether with permission from the high authorities or if they dedicate themselves. 2. We have not come to judge even though we disagree with those who abuse religious scriptures; being that they were sent to do so, trapped by any authority or by the promptings of their own willingness to induce quarrels among the religious denominations. 3. We have not come to judge even though we disagree with those who burn churches and steal church's properties under an excuse of defending God. God's wrath and revenge to this sacrilegious sin is left to God who was mocked and blasphemed by those who defiled His altar. Dear and beloved members of ELCT, honourable sons and daughters of Tanzania, the land of Julius Kambarage Nyerere; what happened in Mbagala in the week of commemorating Nyerere Day, the Father of our beloved Nation, is an insult not to the Father of the Nation but to us who sit on the throne that the Father of the Nation used to sit on. He gloriously and honorably rested after performing good work. May he rest in peace and may the values he stood for resurrect in these ashes resulting from the burning of the peace and tranquility of Tanzania he built. a) Deliberate and open seditious claims that this nation is being ruled by the so called "Christocentric System", and that the Father of the nation may be cursed for all he did to this nation. b) Non-productive argument on the number of believers of various religions in the country and even daring to influence people to boycott the census of Tanzanians if religious affiliation is not part of the exercise. The aim of this argument is the seed that can coordinate and formalize the genocide torture and persecution of the church. d) The ambivalence and silence of state organs against acts of violation of the rules of use of media. In any case, the tolerance of the state does not have broad interest for the future of our nation and it is genocidal torture, persecution of the church, and of all Tanzanians be majority against minority or minority against majority. i) Forcing and finally introducing of wearing of religious symbols in public institutions in order to facilitate the identification of religious differences among Tanzanians. We are questioning: If what happened in Mbagala happens in our public schools and colleges today, how many sons and daughters will be burnt and how many will be killed? ii) Repeated claims that certain foreign embassies of certain countries here in the country be closed down. Such claims imply that only certain embassies of particular countries are the only ones to be here in Tanzania. iii) Demands and undue pressure on the establishment of religious judicial system in the country. iv) Undue religious oriented pressure that interferes with academic administration and legal systems. v) Undue religious oriented pressure on the system of appointment of government officials and in public office. vi) Questioning and misleading the public on the partnership of the government and religious organizations in the provision of social services, particularly health and education. Beloved ELCT members and all Tanzanians, even though those committing these sacrilegious things have been awarded the status "activists" unlike the ordinary activists known by many Tanzanians, we are indebted to warn with all patience that their activitism should not be used to break the government Laws. Tanzania that has peace and solidarity is the fruit of all religions, ethnicities, political ideologies, races and all economic conditions. Even those who do not subscribe to any religion contribute to the peace of this country. With our eyes and ears, we have continued to witness acts of burning churches in Zanzibar, Mwanza, Mdaula, Mto wa Mbu, Tunduru, Rufiji, Kigoma and now Mbagala. During that time the patience of Christians might have been interpreted to be a weakness and cowardice. It should be noted that even the weak and the coward, do come at a point of saying "no more" when they are abused excessively. We do not pray that Christians are should come to that point. We have witnessed government ministries and law enforcement organs being invaded in the break of the day and being pressurized to release criminal suspects; we have witnessed police stations being set on fire; court of law being forced to close their operations; mosques being hijacked, the lives of religious leaders threatened publicly and a retired head of state being slapped publicly because of the so-called religious activism. We have come to the point of asking: What should these people invade so that steps may be taken against them? What should they put on fire so that the leaders who are entrusted to protect the property and life may be alerted? Who should they kill so that it may be believed that these people are a great threat to our national security? We who are called by the holy vows and oaths, we highly urge our religious believers and all Tanzanians in general, those who are duty bound to obey us and those who do not have to obey us, to take in mind that God loves this nation and its people. God will never leave it to perish. For Christians, it is time to continue fasting and praying for the peace of this nation. A true Christian is one who is willing to suffer for Christ and the church. Christians should not kill, torture, revenge in order to defend Christ. Our God is not defended by killing others and burning altars of other religions. In this persecution, the church will grow more steady than before, and in these ashes of Mbagala, a new Tanzania will be born and true liberation will be found. We urge all Christians to forgive and continue to be good citizens and actively be involved in bringing about real change through the proper channels. While others are strategizing to burn churches and altars, Christians are called to put strategies to pray and participate fully and well in claiming our civic rights. Despite being as innocent as doves, we must also be as shrewd as snakes (Matthew 10:16). Let us always remember that "OUR STRUGGLE IS NOT AGAINST FLESH AND BLOOD, BUT AGAINST THE RULERS, AGAINST THE AUTHORITIES, AGAINST THE POWERS OF THIS DARK WORLD AND AGAINST THE SPIRITUAL FORCES OF EVIL IN THE HEAVENLY REALMS," (EPH 6: 12). By our own hands, we, your bishops by the Grace of God. Mbagala, DSM, October 18, 2012. 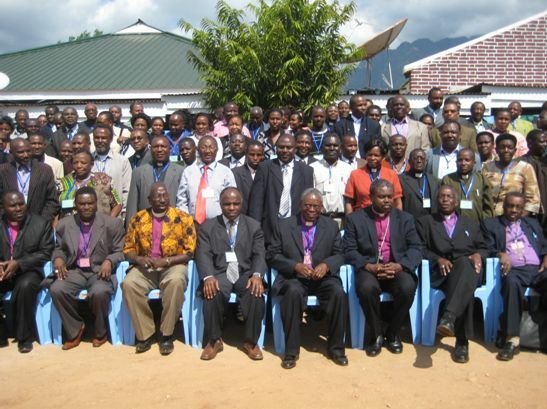 Some of the participants of the ELCT Assembly held in Morogoro in 2010.